I'm running a LotFP campaign set in the Balkans a little while after the reign of Vlad Tepes. I want to invoke the feeling of black and white monster movies (Nosferatu, Frankenstein) but mostly with novel, unfamiliar monsters in the Flame Princess tradition (though Voivodja is out there for the players to find in all its vampiric glory). I put together an inspiration generator to quickly produce creatures that seem like movie monsters pulled from folklore but slightly askew. Then I cheat by rolling on the d100 Guest Attributes and Powers tables on pp. 49 and 50 of A Red & Pleasant Land. The tables are there and great so I'm gonna use them, dammit. It's fast because you can roll all the dice at once or click here (only 10 entries from the R&PL tables are given in the online generator because I got tired of typing) and produces a fairly complete piece of inspiration that works for me. So it meets the Cardinal Rule of generators by being faster than making it up from scratch. 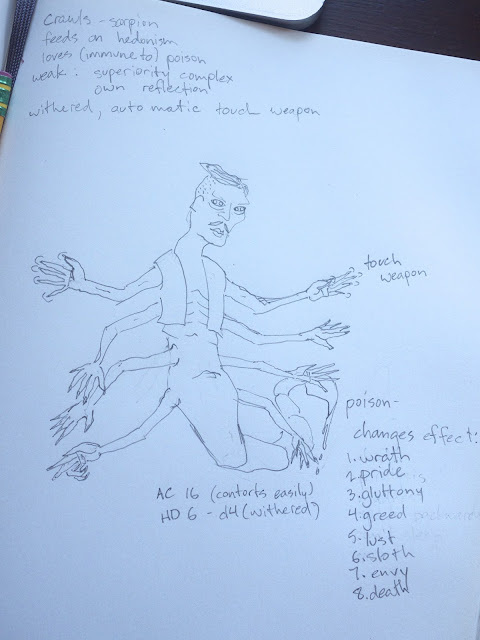 I would then recommend drawing the generated creature and statting it right on the drawing, like so. Ideally, there should be something both human and inhuman about the creature.